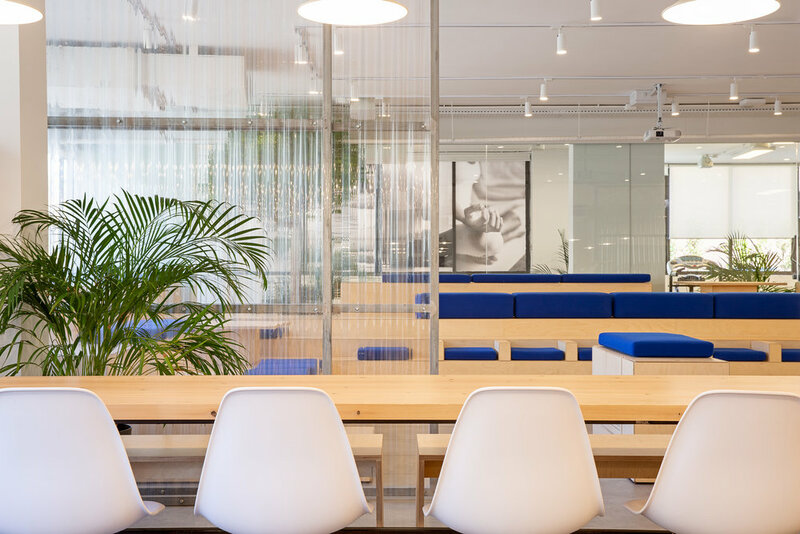 Seeking to enhance the quality of their employees' daily life at the firm, Sécurité Assurance decides to complement its already organic and human offices with a playful addition one floor below. The program consists of a medium scale auditorium, a cafeteria, gym and yoga spaces, as well as play and inspiration spaces. While answering the specified functional requirements, the architectural setup diffuses all spatial boundaries into an overall feeling of transparency and vegetation. After passing through an 'intense blue' staircase meant as an intentional break from the normal working day, the lower floor stage sets on a cement grey floor several levels of intervention: a plywood box for the bathrooms and changing spaces, floating solid pine tables and benches as cafeteria and an auditorium as 'stepped landscape' that easily doubles as a resting/socializing space on several platforms. Behind its glass enclosure, an 'internal street' with ping pong and baby foot leads to a calmer yoga space and more energetic gym room that can be combined as a small workshop area via a sliding polycarbonate partition. A similar device on the cafeteria side allows to occasionally interconnect towards the auditorium. Intentionally avoiding all potential dead-end situations, the circulation loops around the service block that's covered with a black board on the cafeteria side because the best ideas happen when you're not thinking about work. This strategy of 'playing while being at work' extends in every corner of the project thus encouraging informal gathering and conversation, brainstorming, team building in a constant exchange of ideas. Project Team: Karim Nader with Yasmina Baladi and Elie Christian Naameh.